Summer holidays are going on. Moms scratch their heads to find out how to keep their kids engage and how to best utilize time in the best way. Vacations spoil the whole routine of kids and parents too. Even kids do not want to study either. 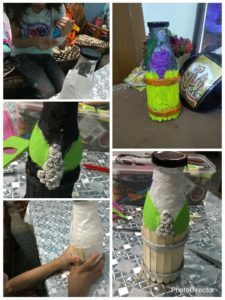 Moms always try in search for activities that make kid happy and engaged. Likewise others, I too tried to engage my kid. She love to do art and craft so I made her do what see like the most. Let’s began the list what we made. My girl always see me writing diary and want diary for herself too. That bring me a thought to make a colourful dairy for her. 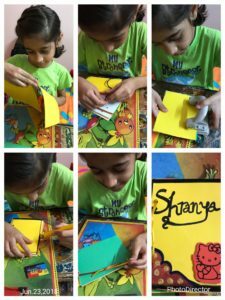 It simple need your help to cut the different colourful sheets in equal size and punch on side and bind it with thread . Let kid Decorate her personal dairy. Tickling brain of mine always search for something new. Kitchen queen is up to use kitchen utilize. I have used tea strainer , cut from middle the strainer part. Wrap the whole strainer with wool. 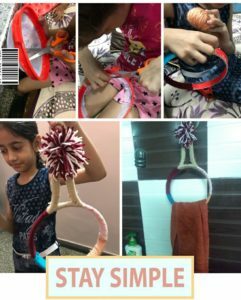 Make a pom pom with wool and decorate it . Our towel hanger is ready. 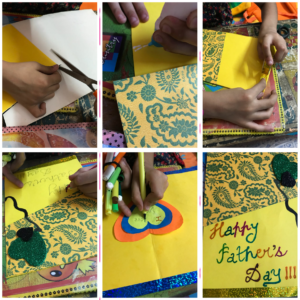 We also made card on father’s day. Folding, decorating and writing . Lets fun began with plastic bottle. 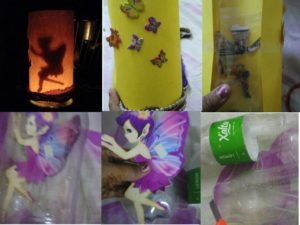 Cut in half and paste the angel sticker or any other inside the bottle. Cover it with little paper and decorate it outside too. Now darken your room and lit the candle. Inside see the magic. 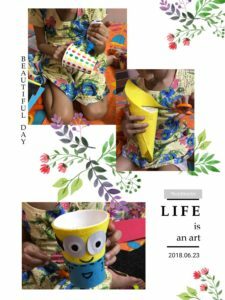 Take paper cup cover it with a sheet as shown in the figure and make eyes, specs, the smile of minion. Now your kid pencil stand is ready. Indulging in some other thing is necessary. I utilities the waste material for the activity. One old glass bottle, ice cream stick, tissue papers,colours. Even you can make it for diwal guys . Old newspaper,CD,fevical, different color glitter.Make it as shown in the image. Peacock is so colourful bird and my daughter loves it so. 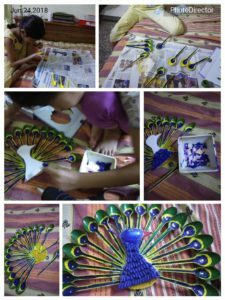 We made peacock with a plastic spoon, ear bud, cardboard. You need a hot gun as well to stick them together. 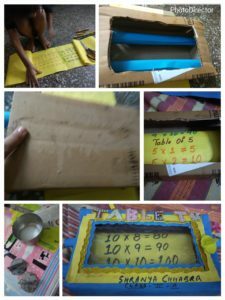 If your kids are learning table then this is the best D.I.Y for them. Learning table with fun way. chart paper write time table it 10. Take a box cut the middle part carefully so the table can be visible. fix the cardboard rod inside and then paste the time table chart from one end and roll it and paste it on another cardboard rod. Cover the box. 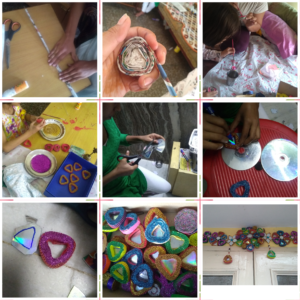 Make it beautiful with your creative idea. Lets roll it learn time table. Children mesmerized with 3D . 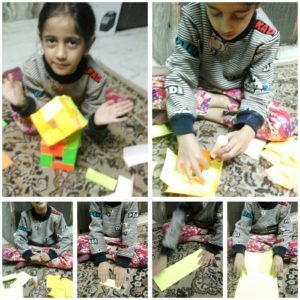 Let them show them how easy to make it 3D cube and card. Just need colourful sheet, fevicol and your creative mind. 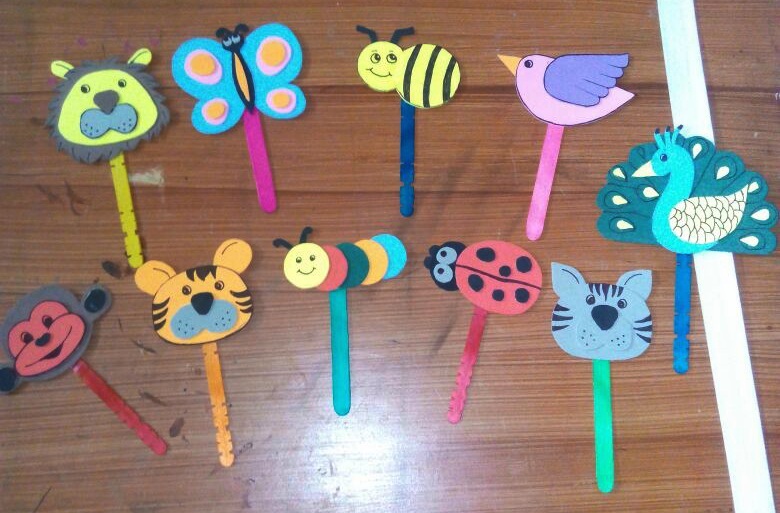 We also did the basic necessary thing that kid must learn like wrapping gift, Bookmark and covering copy. 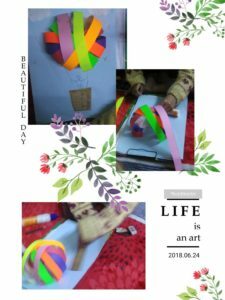 We also made Aeroplane with plastic bottle and paper. Don’t expect perfection from kids let it be fun learning. What you have taught new to kids in this vacations? Is this helpful to you?